Document properties, also known as metadata, are details about a file that describe or identify it. They include details such as title, author name, subject, and keywords that identify the document's topic or contents. If you include the document properties for your files, you can easily organize and identify them later. You can also search for documents based on their properties or insert them into your documents. The following example shows how to add built-in and custom document properties (metadata). // Let's add some documents properties: Author, Subject, Company. The next step is reading all information about a file and displaying it. // Let's add some additional inforamtion. It can be anything you like. /// Create a new document (DOCX) with some built-in properties. // Save our document to DOCX format. /// Read built-in document properties (from .docx) and enumerate them in new PDF document as small report. // Add a paragraph in which all standard information about the document will be stored. // Add a paragraph in which all additional information about the document will be stored. // Add all document properties in the document and save it as PDF file.
''' Create a new document (DOCX) with some built-in properties. Dim filePath As String = "..\DocumentProperties.docx"
' Let's create a simple inscription.
' Let's add some documents properties: Author, Subject, Company. 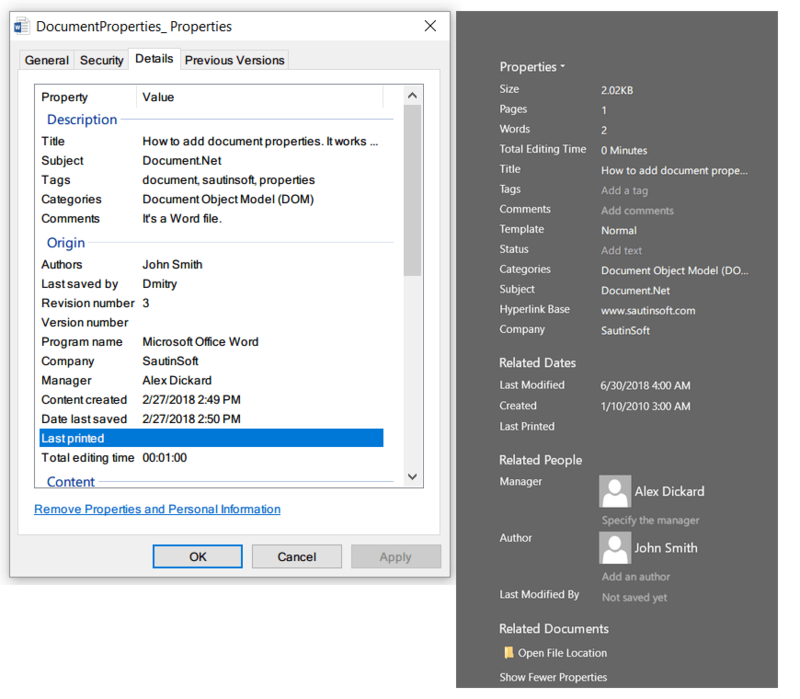 dc.Document.Properties.BuiltIn(BuiltInDocumentProperty.Title) = "How to add document properties. 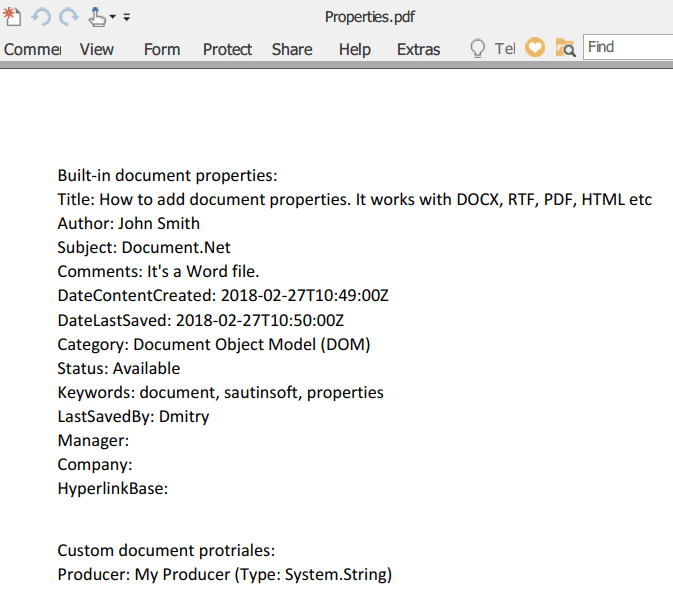 It works with DOCX, RTF, PDF, HTML etc"
dc.Document.Properties.BuiltIn(BuiltInDocumentProperty.Keywords) = "reader, writer, docx, pdf, html, rtf, text"
dc.Document.Properties.BuiltIn(BuiltInDocumentProperty.Category) = "Document Object Model (DOM)"
' Save our document to DOCX format.
''' Read built-in document properties (from .docx) and enumerate them in new PDF document as small report. Dim inpFile As String = "..\DocumentProperties.docx"
Dim statFile As String = "..\Statistics.pdf"
' Let's add some additional inforamtion. It can be anything you like.
' Add a paragraph in which all standard information about the document will be stored.
' Add a paragraph in which all additional information about the document will be stored.
' Add all document properties in the document and save it as PDF file.